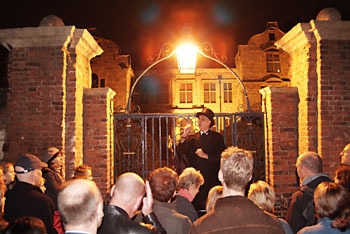 The Ghost Hunt of York offers an evening ,walking ghost tour of York`s haunted locations. Whatever the weather and always on time, the Victorian guide with his frock coat, top hat and Gladstone bag manifests at the strike of half past seven at the bottom of Shambles, England's most famous mediaeval street. Ringing his death bell he gathers the awaiting ghost hunters and leads on to York`s darker side. The Ghost Hunt presents classic York ghost stories in a captivating style, no tardy tales of tedium but intelligent, energetic accounts from a guide with a predilection for fun and entertainment, illustrating the narrative with props and illusion. It is a journey that takes your emotions from horror to hilarity. The ghostly guide puts the crowd up to practical jokes and comic re-enactment in hysterical moments of audience participation, the most 'notorious' of which is the 'restaurant' where unsuspecting customers of Caesar's restaurant are subjected to more orchestrated body parts than they ordered from the menu. The Ghost Hunt audience is predominately adult but this York ghost walk is thoroughly enjoyed by the whole family. 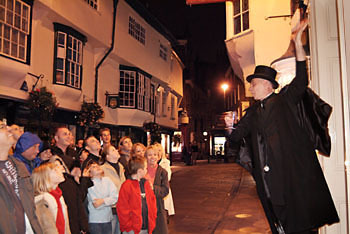 Throughout, York's magnificent architecture and maze of streets and 'snickelways' are the perfect backdrop to each performance of the Ghost Hunt. It is truly outstanding entertainment.